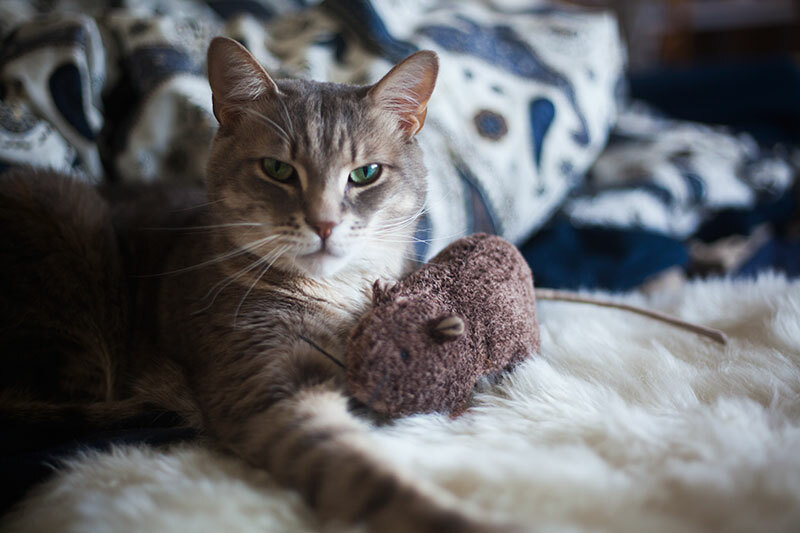 Say hello to the catnip toy that’s been with my cat Avery since the very beginning of our adventures together. If there was ever an equivalent to a child’s first teddy bear for a pet, this would be Avery’s. I have kitten pictures of this little fella snuggling up to to this very toy (posed, of course, in most situations; I’ll share a picture later in this post), and I’ve even gone so far as to buy a second for him to play with to preserve the original for sentimental reasons, and in case they disappear off the market one day. 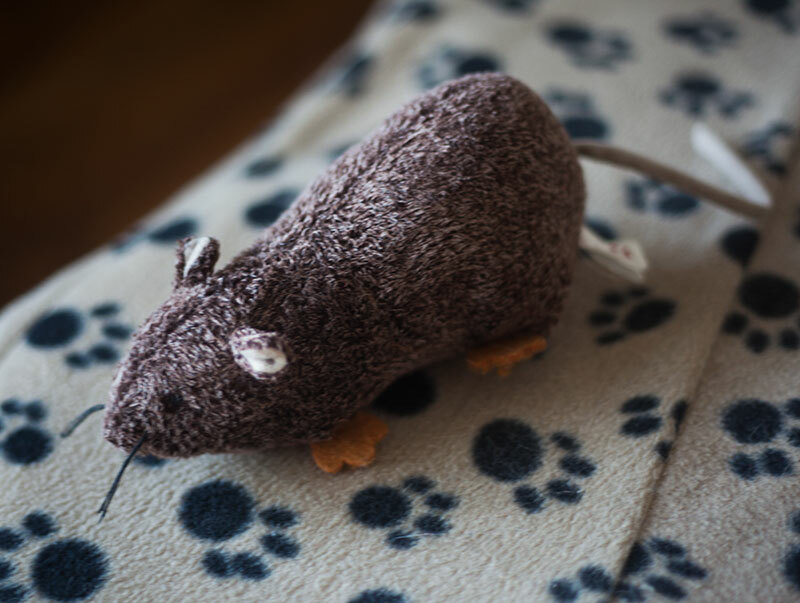 Has the Petlinks Jeepers Creepers Rat always been his favourite toy? Does he play with it religiously? Has he even any idea that this toy has been around for him since we first adopted him many years ago? Of course not, but as far as pet toys go, it’s been a trusty sidekick (pun intended, since a side kick is exactly how he plays with it) to Avery for a very long time, and thus deserves some recognition. I’m going to start by saying: Avery doesn’t care about catnip in toys. Ever. So I don’t even bother to fill this thing. I filled the first one we got, and he didn’t really care, so this second one has never had catnip stuffed (again, pun intended) into it. 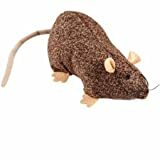 For those of you whose cats are quite normal and are even remotely near a little enticed by catnip in toys, the velcro pouch on the underside of this toy rat is perfect. 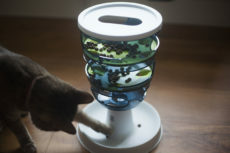 Since the toy is durable, it will live long past most catnip toys on the market, so you’ll want to have the ability to switch out catnip whenever it’s no longer potent. You can get quite a bit of catnip in there if you really want to, but like I said, I don’t even bother, considering Avery genuinely does not care. When it comes to my little oddling, catnip in toys doesn’t impact him past the first 10 seconds of introduction. 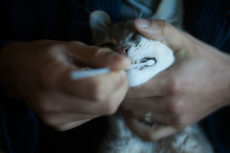 Even if you re-introduce him to a catnip toy the next day, or week, or month, it just doesn’t do anything for him. 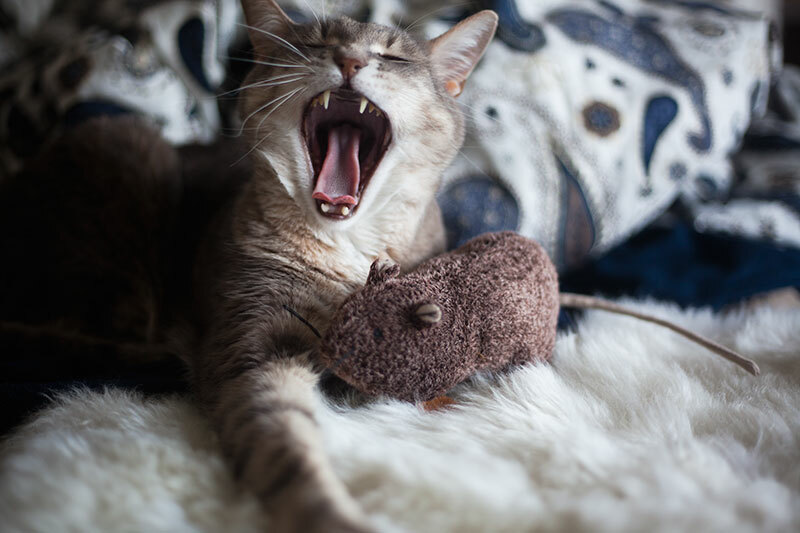 Either he likes the toy or he does not, and if he doesn’t, catnip’s not going to make an ounce of difference. Besides, he’s much more into drag-string-like-objects-against-the-floor games, and playing with feather wands, as much as this breaks my heart a little, especially when there are so many cute catnip toys I miss out on buying, Iike these insanely adorable sushi catnip toys that I desperately wish to buy, but know if I do grab for him, he will never even glance at. 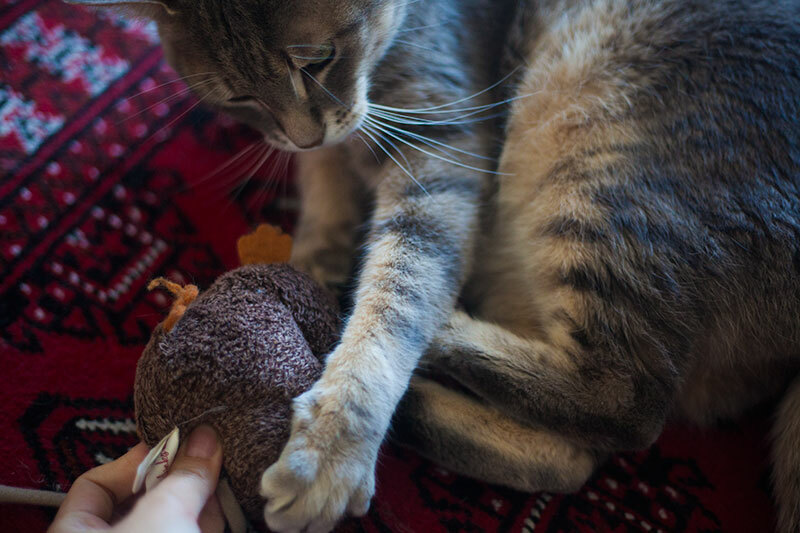 But that’s my cat, and with my cat’s odd taste in cat toys come many weird quirks – such as this cat toy that by all accounts should fail on every front for him, and yet somehow it doesn’t? I’m getting a bit ahead of myself, though. First, I want to talk a little about why I bought this toy in the first place. Setting the stage: Flash back a few years. Thomas and I are standing in a PetSmart. The previous day, the stray cat who frequently came by our window (yes, Avery) and who we’d absolutely fallen in love with, had come to trust us to the point where he’d spent the whole evening playing and cuddling and even standing at our window crying for us to come spend more time with him (pictures of this day here). We took him straight to the vet that morning, getting him neutered and shots so that we could adopt him right away, but he had to stay the night at the vet’s. We’d had absolutely no cats ever at this point, but were taking care of a friend’s cat while he was overseas, so we luckily knew what we needed. Taking advantage of the time we were given, we were at the PetSmart to stock up on a litter box, a brush, a few toys… that sort of thing. Getting to the cat toy section, well there are a lot of toys in a PetSmart as I’m sure you know, but this one pretty much called out to me. Why did I have to have it? It. Looks. Like. A. Rat. In a quite uncanny way – it’s pretty remarkably accurate for a plush toy: spot on in terms of its overall size, and has the perfect proportions as well if you ask me. And, back then, I’d have been something of an expert on how rats looked up close, considering Thomas and I had the mildly unpleasant task of defrosting frozen rats from our freezer so that we could feed our other pet at the time, our ball python, Havana. The likeness to a real rat made me smile, and so I grabbed it and brought it home with the other things in our haul. My satisfaction over how similar to a real rat this toy looks has only been justified over the years. Back when I used to tutor from home, multiple times one of my mature students would jump seeing this toy on the floor. Even Thomas’ grandmother, Sue, was once startled by this hilarious thing. 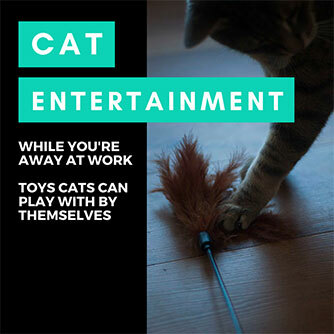 Nothing more entertaining in my opinion, especially since it’s not a prank at all, just an innocent cat toy; so when someone is startled, it makes you chuckle a little since it’s something you’re so used to but they’re obviously not. Avery didn’t take a liking to the rat immediately, but he did over time. 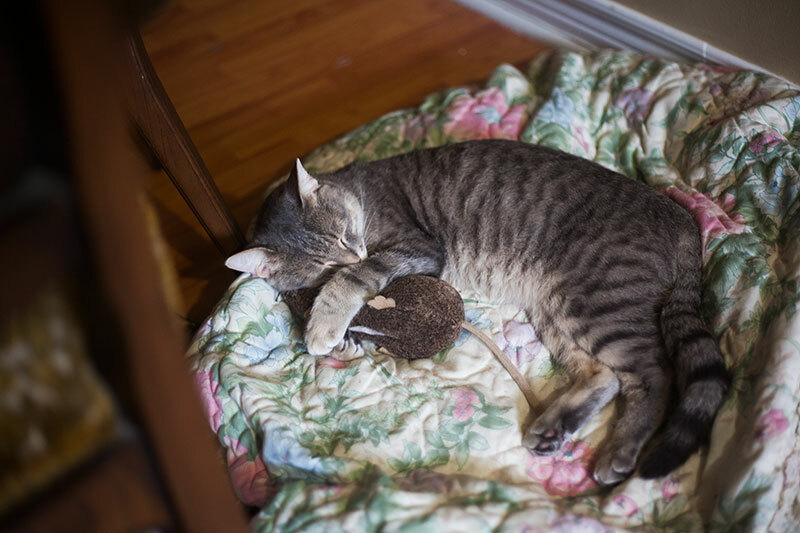 At first, we’d stuff it under his arms while he was sleeping for cute pictures (like the one below) where he was hugging the rat. Then he’d snuggle up with it by himself every so often, which was crazy adorable and made me melt. 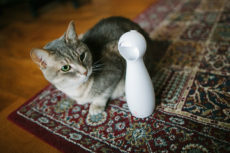 Eventually, we figured out how to play with him with it – if we pushed it close to his body when he was lying down, but hyper, he’d grab it with his front arms and give it side kicks with his hind legs. To this day he’ll still do two or three bouts of sidekicks at it around once a day before getting bored and walking away. But the fact that it engages him so often is saying a lot from my lazy cat. The Jeepers Creepers Toy Rat is 100% not one of the most fascinating cat toys ever. In fact, as I’ve already stated, Avery will quite literally only play with it for a few seconds to a minute or two at absolute most. It is, however, consistent in its ability to get Avery to release some energy while he’s wired, regardless of the fact that he doesn’t engage with it for prolonged periods of time. 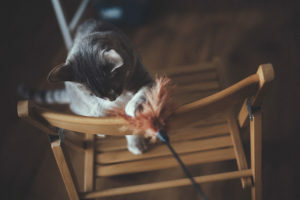 He never plays with this toy by himself. 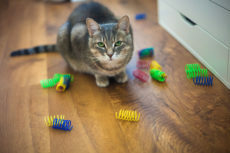 Seems like the kind of toy any other cat would love to attack with no human intervention needed, but with Avery, it’s a no go. 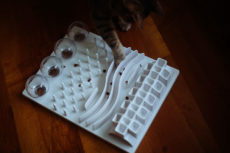 I don’t hold it against this toy because these cat springs (reviewed here) & DIY aluminum foil pancakes are the only stationary toys he’s ever played with by himself in his life. That being said, the Jeepers Creepers Rat has a definite advantage over either of these two toys in a different area – he’ll happily engage with this toy nearly every time (I’d say about 80% of the time), while springs & pancakes and anything else, he’ll have something like a 25% chance of engaging with. Many days, I find myself using this plush as an instigator for playtime. Usually it’s easier to keep Avery playing once he’s made the first step engaging in playtime, so the fact that this toy does that pretty well means I regularly use it, even if it’s very briefly at the beginning of play sessions. Getting him to kick this toy for even a few moments will often help increase his prey drive enough to get him to play with a feather toy or go after some yarn alternative that I’ll drag across the floor for him to go after, I’d say, upping the regular 25% chance to a nice 50% chance he’ll engage with some of these prolonged playtime toys. How I get him to play with the Jeepers Creepers Rat is pretty simple: I topple him over (he has no problems letting me do this), so that he’s on his side, I push the rat into his hind legs, at which point he automatically grabs the toy with his front paws and starts kicking it with his hind legs like in the picture above. Many times, he’ll bite the toy simultaneously while kicking it. 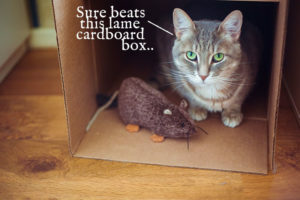 If I leave the rat, he’ll get bored, but if I tug it or pull it so it feels like the rat is trying to run away from him, he’ll remain interested for a number of kicks & bites. Eventually Avery gets bored of kicking and biting, or gets a bit wired, so he runs off. If I call him back and he comes for another round, I yet again push him on his side, and rinse and repeat. He usually wont do more than 2-3 rounds of kicks before that’s it, he’s not interested anymore, but at this point, I’ll have engaged him enough with this first toy that he’s more likely to play a little with another one. And if he doesn’t play (which, as I’ve said, happens around 50% of the time) at least his prey drive has been put to some use. 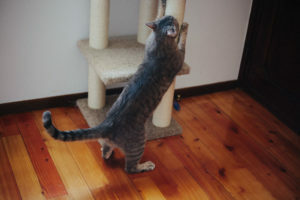 The rest of his exercise he needs I make sure he gets with this cat workout and other techniques that I go over in this article, but definitely playing with this toy helps with the process of making sure this lazy cat engages in some predator behaviour. 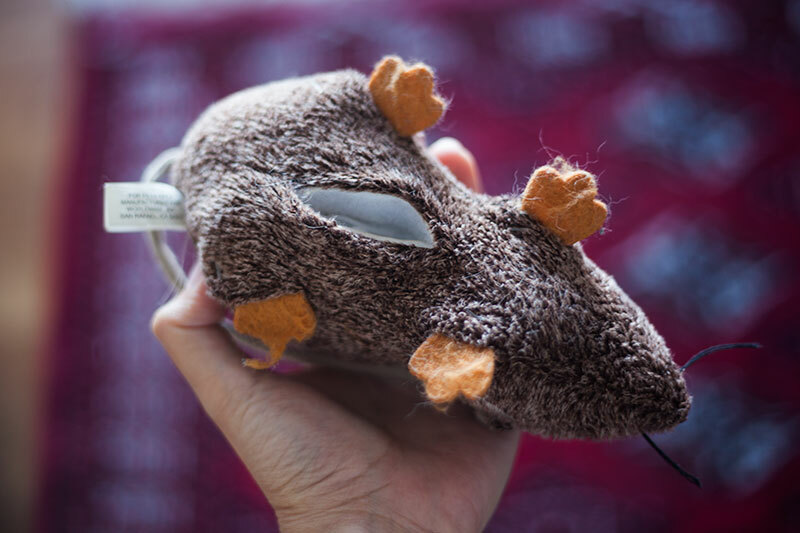 Is the Petlinks Jeepers Creepers rat the perfect cat toy? No, but for my lazy Avery to have never gotten sick of it over all the years he’s had it, it’s pretty stinkin’ great in my books. 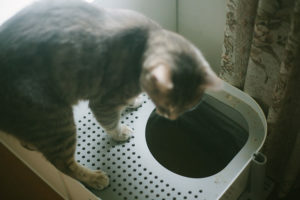 It engages him well, and that’s huge for my cat. While this toy rat certainly doesn’t keep his attention for long, it is one of the only toys I’ve ever bought Avery to have stayed in the mix of “remotely engaging” entertainment consistently from way back since he was a tyke. 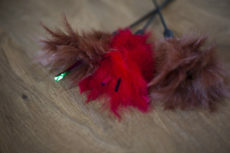 And honestly, that fact in itself makes this cat toy deserving of a huge thumbs up from me. Well, this is perfect! Normally, mama just buys a stuffed something and cuts open its tummy and pulls out all the stuffing and fills it with my nip, then sews it up. But this is GREAT and much easier. I do need refills often…. That does look real. I used to tutor too, but I went to the students’ homes. I started off going to students’ homes and coffee shops, but eventually it got to the point where I was doing so much driving, I couldn’t stand it anymore, and made them come to me. It was a nice change of pace, especially since a lot of people lived very far from me. What a fun toy! We have one that’s similar to that but we don’t play with it much. Maybe we should! 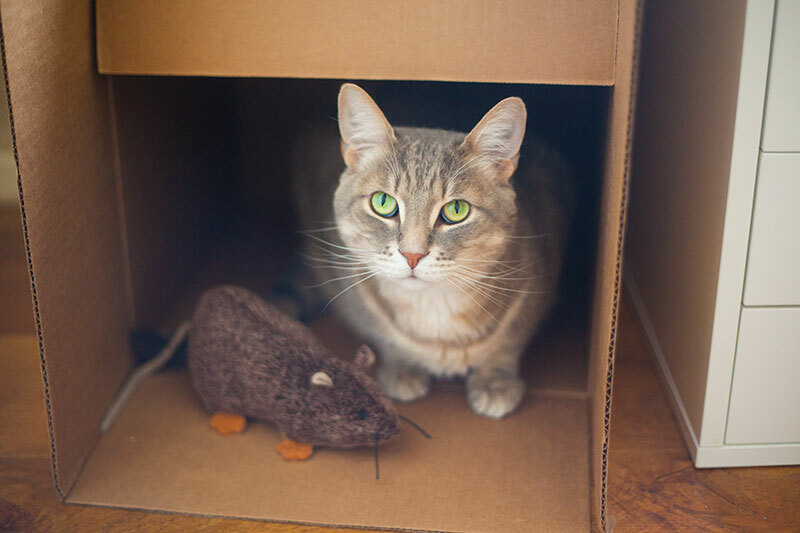 We love all of those photos and the rats looks like a nice snuggly pal fur sure! That is too cute! A cat for your cat. 🙂 It’s so strange what they choose isn’t it? We have a big pink and white rat that gets some attention. I don’t know where it came from, and it does not have a catnip pouch. I followed the link and read your original story about Avery at the window, which was very much fun to read. Near the end I feared he was microchipped, but tension released. Avery was a smart guy picking out where he wanted to live! 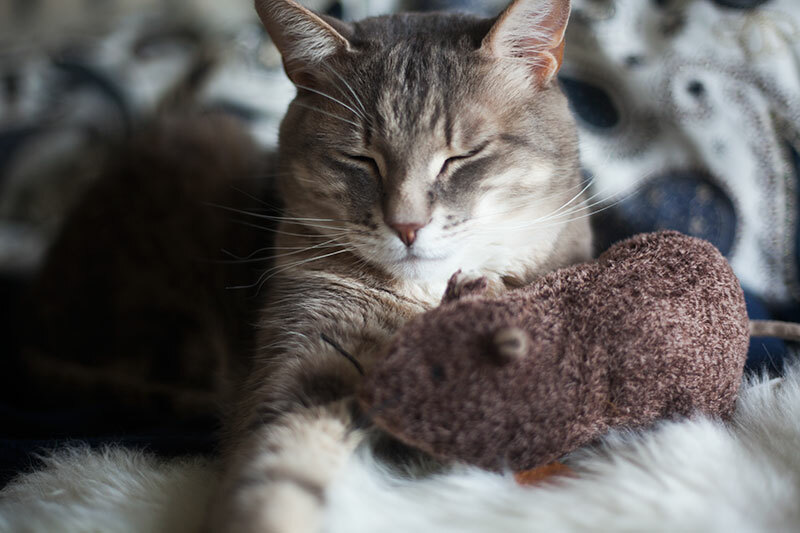 As for the rat, I have a cat who seemed to bond early with a small stuffed raccoon. It is sort of a bunk buddy. That’s too cute about the stuffed raccoon bonding. 🙂 I’d love to see pictures if you have any! I guess it’s not just Avery who’s odd with his “favourites” choices! 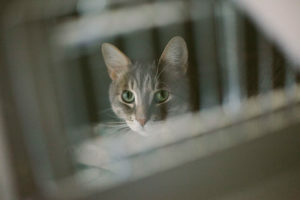 Thanks so much for dropping by my personal blog to read the story about him at the window. It would’ve been so heartbreaking for us if he was microchipped, especially since I don’t think Thomas and I would’ve adopted a different cat at that point in our lives, thus meaning that neither my brother (over @ petsoverload.com) nor my mother would have had cats of their own. Us having a cat was a huge catalyst to them getting theirs. 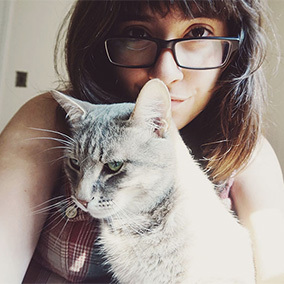 Thomas and I may even have waited until after moving to the UK to get a cat (which happened around 2 years after we got Avery), and then may even have pushed things off further since we would likely have deemed our current apartment too small for a pet. So I’m really happy that things turned out this way, for way more reasons than just we wouldn’t have had *specifically* Avery. All three of our families likely would’ve been catless.